The French Accor chain hotels in Seoul: Novotel Ambassador Gangnam and Sofitel Ambassador Seoul present a special French Cheese Promotion featuring various types of cheese from France. The promotion, available from October 26 through 28 at the bistro of Novotel Ambassador Gangnam and from October 31 through November 2 at Cafe de Chef of Sofitel Ambassador Seoul, features "Cheese Dish Set Menu" at 45,000won with the main dish to be chosen from "Medallion of veal with a Mozzarella, tomato & basil topping, served with a mushroom & Swiss chard lasagne" or "Steamed filet of Snapper, sauce Choron garnished with potatoes and cheese bake." The other option is a 60,000won cheese buffet featuring over 60 kinds of authentic French cheese. A glass of wine is served for with no extra charge. 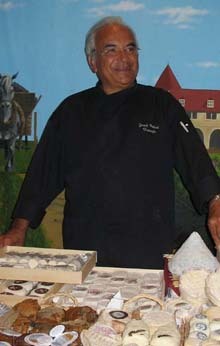 Also during the promotion, 2 specially invited cheese masters from France, Patrick Lecour and Gerard Poulard will present over 60 kinds of unique and authentic French cheese including soft and sweet "camembert," deep tasted "Roquefort" made of green mold, the queen of cheese "brie" and "epoisses." Join at Novotel Ambassador Gangnam and Sofitel Ambassador Seoul and grab your chance to experience the authentic taste of French cheese.